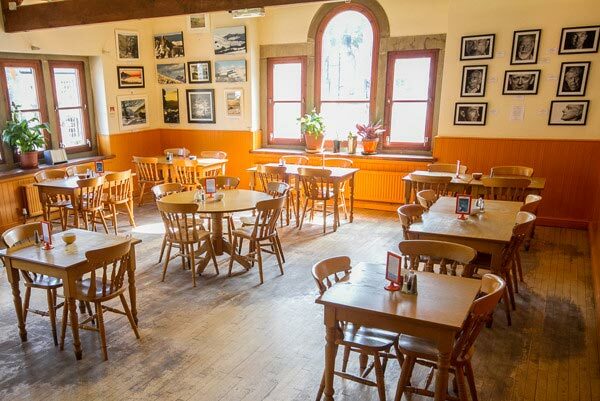 The Outside Café is a welcome rest for hill walkers, climbers and locals, where you can enjoy a legendary pint of tea with homemade cakes, a satisfyingly stuffed baked spud or pile up your plate with our hugely popular “build your own” breakfasts. An adaptable menu offers everything from soups and sandwiches to full meals or cream teas. We do our best to cater for all tastes and diets; including a variety of vegetarian and vegan options, child’s portions and other dietary requirements taken care of on request. We’ve selected the best ingredients, and where possible we’ll always choose Peak District suppliers. All our meat comes from Paul Bowyers quality butchers in Hathersage; we use free range eggs from our local dairy and we only use Fairtrade tea and sugar. For nearly thirty years, we’ve been serving up the sustenance you need to fuel your activities, replenish your energy levels after a day on the hill, or just offering comfort food when you’ve been rained off. Whether you’re a visitor to the Peak District or a Hope Valley resident, you and your muddy boots (and even your damp dogs) are equally welcome.